With spring in full bloom, the weather is starting to warm up. The longer the sun is out, the more important it is to protect your skin from the sun’s harmful UVA and UVB rays. Many people desire a youthful face, but the sun can damage the skin, causing fine lines and wrinkles to form and making a person look aged and worn out. The key to preventing premature aging is to start a daily skin care regimen. 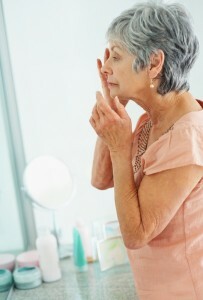 Although we cannot halt the aging process, we can slow it down by adopting healthy skin habits. Applying sunscreen daily before sun exposure is necessary to prevent premature aging. You should use a broad-spectrum sunscreen with an SPF of 30 or higher every day. Keeping the skin clean is essential for preventing breakouts, blemishes, and dull skin. You should wash your face daily with the correct cleanser for your skin type. Moisturizing your face in the morning and at night is important. It is recommended to use a lotion that is gentle enough for everyday use and isn’t heavy in fragrances. Sticking to a healthy diet is crucial in keeping your skin fresh and clear. Avoiding high-sugared foods, alcohol, caffeine, and cigarettes will help to retain moisture to prevent wrinkles and fine lines from forming. Be sure to consume lots of fruits and vegetables for optimal results. Sleep has a huge impact on a person’s health. Sleeping allows the body to regenerate and refresh and helps prevent creases and wrinkles from developing. You should get at least seven to eight hours of sleep every night. Hydration plays a primary role in our skin health. Maintaining a hydrated body helps to retain moisture to create radiant skin and to prevent sagging. Aim to drink at least eight glasses of water every day. BOTOX® Cosmetic: An FDA-approved neurotoxin made of a protein derived from botulinum toxin type A that blocks nerve impulses to paralyze facial muscles temporarily. BOTOX® Cosmetic can diminish the appearance of frown lines, forehead wrinkles, and crow’s feet for three to six months. Sciton® skin resurfacing: The CO₂ laser emits a beam of light to remove unwanted tissue. It vaporizes skin cells to reduce the appearance of sun-damaged skin, facial wrinkles, and scars. Sciton® Infini: Infrared energy is used to heat the dermal layer of the skin and stimulate collagen growth. The Sciton® Infini is effective for treating acne as well as lax, aged, or photodamaged skin. If you want more skin care advice from a plastic surgeon or are interested in a cosmetic treatment, schedule your consultation with Dr. Robert Wald today! Contact us by calling (714) 312-3549 or by filling out our online contact form. This entry was posted on Wednesday, May 24th, 2017 at 1:29 am	and is filed under Uncategorized. The cardinal feature observed in a skin lesion that proves to be melanoma is a change observed over a period of months. The time scale of the observed change is important. If a lesion grows so that it doubles its size within 10 days, it is usually an inflammatory (irritant) condition. If the lesion grows slowly that the patient or his relatives are unsure of any change, the lesion is often benign. However, medical advice should be sought regarding a lesion that doubles its size in 3 to 8 months. These symptoms may include growth in the diameter or contour of the mole, a change in color, bleeding, itching, ulceration, or the development of a palpable lymph node. Growth (increased size) and color change (usually darker) are the symptoms most commonly seen first. They occur in over 70% of early, curable melanomas. Most lesions arise from a pre-existing mole, either on the trunk or leg. Please note that these facts and see your doctor immediately if you see these types of dark lesions. This entry was posted on Monday, November 29th, 2010 at 8:52 pm	and is filed under Uncategorized. In my practice, a lot of patients point out to me red spots located on their faces and body. It is important to realize that some of these red areas may be early or actual skin cancer. The most common types of red spots are actinic keratosis (premalignant) and basal cell carcinomas. It is very difficult for a patient to determine what these lesions represent. Typically, a red lesion that is present for many months, that itches, is scaly and flakes, is of concern. A strong history of sun exposure and a fair skinned individual are at high risk for developing these lesions. When I see these lesions, a biopsy must be done to determine a diagnosis. In most cases, various anticancer creams can be applied to non-cancerous lesions. If a basal cell cancer is found, a minor surgery or radiation therapy is used to treat these cancers. It is important to realize that these cancers are not life threatening as long as they are caught early and treated. It is my advice that everyone examine their selves regularly and see their doctor for any suspicious lesions. This entry was posted on Monday, November 29th, 2010 at 8:58 pm	and is filed under Uncategorized. Today, most patients want facial improvement and a youthful appearance without surgery, discomfort or prolonged swelling and bruising. This can be accomplished with facial fillers (Juvederm, Radiesse). As we age, the underlying facial soft tissue atrophies and we begin to hallow out. Laugh lines, crow’s feet and other facial wrinkles develop causing us to look older and less vibrant than we feel. Today, natural and biocompatible substances such as hyaluronic acid (Restylane, hylaform), calcium hydroxylapatite (Radiesse) and fat are helping to restore a more youthful appearance for millions of women and men. Research is ongoing, and new products are constantly being developed that further expand the choices available to physicians and patients. Fillers are used to fill lines, wrinkles and lips. They may also be used to reduce the appearance of scarring caused by acne, chicken pox or injury. We also use them to augment cheeks and chins. One of the ways I am using fillers if for facial shaping. By building up the cheekbones and using hylaform to fill the indent in front of the jowls, disguising it, I can give the face a younger shape. This entry was posted on Monday, November 29th, 2010 at 9:01 pm	and is filed under Uncategorized. Early Detection of Skin Cancer May Save Your Life! Skin cancer today is quite prevalent. We are all exposed constantly to the sun. Many of us as teenagers and adults enjoy the benefits of a body that is tan and radiant. However, the sun damages our skin from its ultraviolet radiation and can cause skin cancer. Black/brown lesions with irregular borders are suspicious for early cancer. Lesions that change in color or size are also of concern. When these types of lesions are seen, a biopsy is required. This is a simple procedure performed in the office. If the biopsy returns atypia, a excision of the area will be necessary. By early detection, lives may be saved and deformity minimized. This entry was posted on Wednesday, April 4th, 2012 at 2:53 am	and is filed under Uncategorized.